Kilkenny’s stuttering league campaign sent the GAA statisticians scrambling for their notebooks. For the first time under Brian Cody, they suffered three straight defeats; set against the backdrop of retirements which stripped 48 senior All-Ireland medals from the dressing room, it didn’t look promising. After their 24-point evisceration of Wexford, you can draw a definitive line between the league and championship. They were ominously good, scoring 5-25 — 4-21 from play — though Wexford hardly contested a ball as the Cats ran up the score in the final 20 minutes. This wasn’t Kilkenny’s best performance but coming off the back of a 12-week layoff, and with Richie Power and Colin Fennelly still to return to the fold, it was an impressive reminder of why they’re always the team to beat. It takes something special to overshadow Richie Hogan, particularly when the reigning Hurler of the Year had a hand in Kilkenny’s first three goals and finished with 1-5 from play. But you couldn’t give the Man of the Match award to anyone other than Ger Aylward. This was his first senior championship start and he seized it in impressive fashion, rattling a hat-trick past Mark Fanning as part of his 3-5 total. The clinical finishing was just one part of an industrious performance from the 23-year-old. He might still struggle to force his way into a picture crowded with attacking talent but this was the perfect performance to show Cody what he can do. 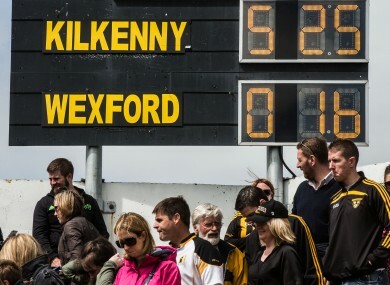 For 10 minutes, it looked as though Wexford might have the measure of Kilkenny. They arrived with intensity as well as a gameplan, based on careful retention of possession, that allowed them to gain a foothold in opening exchanges. Even as Kilkenny started to fire in goals, Wexford were still shading individual battles, though reeling in a six-point deficit against the wind was always going to be an impossible job. What will frustrate Liam Dunne most is the manner in which they contributed to their own downfall — aimless balls from the half-back line, going long or into the hands of a Kilkenny defender; sideline cuts straight to an opponent; puck-outs going straight into touch; wasteful wides shot under no pressure. If Kilkenny never needed to get out of third gear to kill the game, it’s because Wexford made it all too easy for them. Jack Guiney is a fantastic young hurler — but his absence didn’t cause Wexford to lose by 24 points. He certainly would have ensured a slightly more lively afternoon for the Kilkenny defence but Dunne’s decision to drop him for a disciplinary breach took the visitors’ most potent threat out of the equation. Wexford’s name will go into the qualifier hat on Monday morning with question marks still hanging over the availability of their star forward. Will Guiney be part of the effort to rebuild their summer? 5. Leinster final set to be a goalfest? By posting 30 scores at a canter, Kilkenny showed that anything Galway can do, they can do better. Anthony Cunningham’s Tribesmen laid down a very clear marker when they followed up their 13-point win over Dublin with a 20-point drubbing of Laois on Saturday. Consciously or otherwise, Kilkenny responded with a 24-point win of their own. Now the counties are set to meet in the Leinster final in a fortnight’s time — and whether they voice it or not, you can be sure that Kilkenny will want revenge for their provincial defeat in 2012. The prospect of seeing two of the country’s outstanding attacks go head-to-head is a mouthwatering one. The games against Dublin might hand Galway a slight advantage in the preparation stakes but as always, Kilkenny present a very unique test. Email “5 talking points after Kilkenny run riot against Wexford”. Feedback on “5 talking points after Kilkenny run riot against Wexford”.